7th Grade Math TEKS Equations and Inequalities Mini-Assessments. 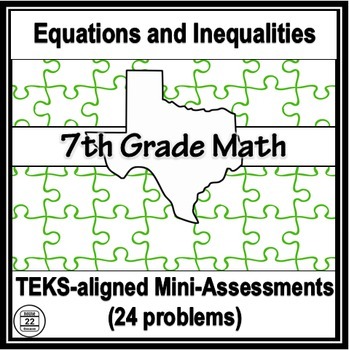 This set includes 6 assessments with 4 problems each aligned to the Seventh Grade Equations and Inequalities TEKS. There are 24 total problems!!! These questions are included in the 7th Grade Math TEKS Assessments Bundle and the 7th Grade Math STAAR Test Prep Bundle. Please check your previous purchases before selecting this product. Each purchase of Four x Four Assessments: 7th Grade Equations and Inequalities Texas Edition is for individual use only. 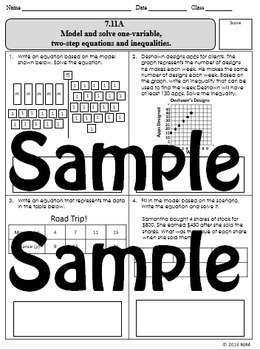 The individual licensee can make copies for classroom use for students only. Licensee cannot upload these materials to the Internet for any reason.